Smiles that enhance the best portions of their facial features and personality. This patient works with the public and had serious concerns about her smile because she was embarrassed to show her teeth. 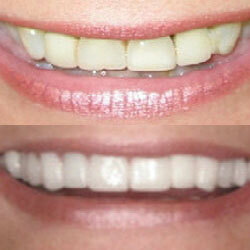 She had “cosmetic” work performed by a general dentist to improve her smile. Unfortunately, all of the spaces weren't closed, the teeth were still too small and short, and the general dentist did not know why the veneers continued to come off. Her general dentist and dental laboratory did not receive the postgraduate training to solve advanced aesthetic problems that were needed for her situation. After realizing she had wasted her time and money, she came to our office for corrective dental treatment. She received a smile more desirable than she could have imagined. Jeff is in the real estate business and meets with clients on a regular basis. Concerned about his smile, Jeff went to a dentist who said he would have to pull all of his teeth and have dentures. 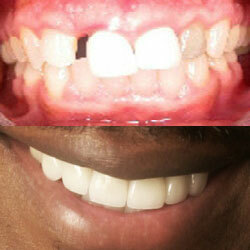 When he went to Dr. Cooper, he didn’t believe he could have a beautiful smile. He decided, however, to give Dr. Cooper a chance. “I hated going to the dentist,” Jeff said, “and I had a smile to prove it.” When Dr. Cooper completed the work, he was blown away by the results. “It would take a small miracle to fix me,” he said, “and she did it”. Sheila was about to turn 50 years old. She spent time and money on everyone else in the family over the years, but never really invested in herself. As a gift to herself, she decided to beautify her smile. Dr. Cooper sat with her and went over her smile design. Sheila is a director in her corporate office. 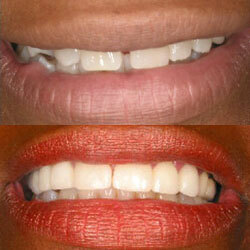 Dr. Cooper placed her veneers on Friday. When she returned to work the following Monday, a couple of her colleagues insisted she had a mini-face lift over the weekend. She laughed without revealing her secret. Her new smile made her look as if she had taken 10 years off of her age. Professional dental studies have shown new smiles make a person feel more attractive, intelligent, happy, successful in their career, friendly, and sensitive to other people. This data suggests you will not only look better and feel more confident; you’ll also experience a broader array of benefits. That’s why Kimberly came in to see Dr. Cooper. She wanted a gorgeous smile. Dr. Cooper went over her smile design with her. After her veneers were placed, Kimberly was very excited about her new smile. This patient is a high school teacher who has always been self-conscious of her teeth; therefore, she rarely smiled. 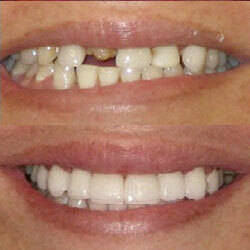 She wanted to close some spaces and replace missing teeth to give her a more youthful smile. With so many missing teeth, she felt her jaw did not have the proper resting spot. First, we had to identify where her jaw felt most comfortable and stable. 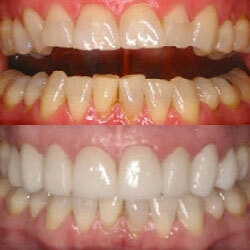 After we had determined the proper place, we were able to proceed with cosmetic dentistry. Having a gorgeous, distinct smile doesn’t have to be a dream anymore. Our comforts, techniques, and financing solutions can make it a reality.